Dr. Sue Gordon’s appointment to the Catholic Church’s PR, unit charged with containing the fall-out from the Royal Commission, almost gives it the credibility it craves. Sue is a member of the “stolen generation”. Born at Belele Station, near Meekatharra, Western Australia in 1944, she was taken from her mother and family at the age of four and raised at Sister Kate’s home in Queens Park, Western Australia. 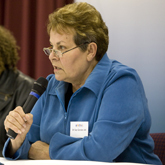 In 1988 she was appointed as the state’s first indigenous magistrate, in the Children’s Court. When the Howard Government shut down ATSIC, it was replaced with the National Indigenous Council, with Dr.Gordon as its head. On being asked for her views on the push for an apology from the Howard Government for the Stolen Generation issue, she is recorded as saying “”No. I personally didn’t want an apology because it should have gone to my mother. But my mother’s passed away now, so it’s too late. And what’s an apology going to achieve now?” The apology was later delivered by Prime Minister Rudd. In June 2007 she was appointed as Chairperson of Prime Minister Howard’s Northern Territory Emergency Response Taskforce, known as the “Intervention”.